Home / entertainment / The Weekend has landed.... nearly. The Weekend has landed.... nearly. 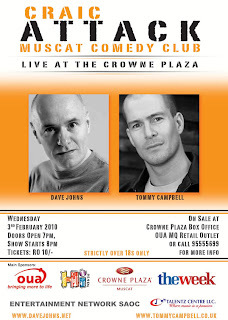 For those of you that have enjoyed previous Craic Attack shows, the Muscat Comedy Club have another one... and it's tonight! I didn't realise.... but I was having a senile moment last night and slipped my alarm clock onto radio instead of the beep beep beep, and Darren Shortt woke me up with the news that there's a comedy gig on tonight. And there are still some tickets available - and they can be had on the door tonight. The previous events by these people have all been really funny, so there's no reason to believe that this one wont be either... So if you're free tonight, and have a spare tenner... check it out @ the Crowne Plaza. Co-incidentally, am I the only one that thinks the Crowne Plaza hotel looks like a cruise ship?